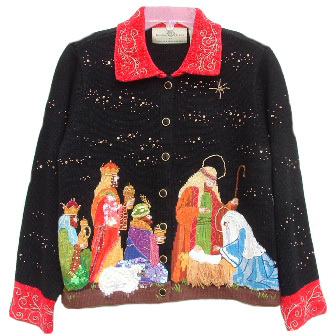 Don’t worry guys, there’s nativity fug for you, too! 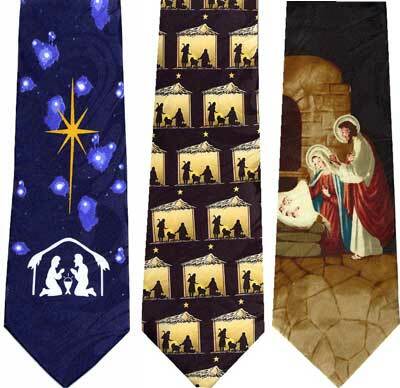 Nativity ties for everyone! I’m pretty sure the one on the far left isn’t supposed to be the silhouette of two people playing pattycake over a tiki lamp. But what do I know. I’m not checking out your rack, I’m following the star. Are you sure this is sparkly enough? I’m worried that it can’t be seen from space. This entry was posted in fashion police on December 16, 2007 by admin. I would hate to see a spaghetti sauce stain land on baby JC of the 3rd tie. uh-oh, I would totally wear one of those. do I need medications? btw, some robots can love. Who can ever forget Alley Sheedy making over a robot and reporting “Number 5 is alive.”? I love the slightly off-kilter multi-manger tie. I don’t know why, but I do. Maybe it’s the sense of inebriation it induces. Pattycake over a tiki lamp. Don we now our lame apparel. Sara, you so totally rock! Hey, you and party Joseph need to get together! 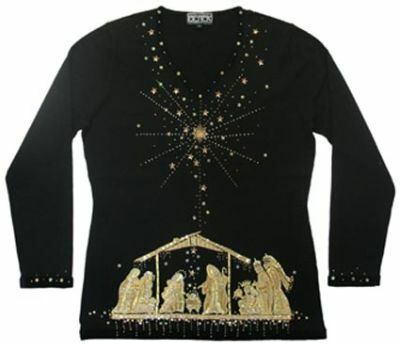 I love the high rise nativity condo style tie! Freaky. DRY CLEAN ONLY-by order of God.